Health Care Access, and Why PCPs? A friend posted this picture of a rainbow that appeared two days ago in our area, a most welcome sight since we had had no moisture at all for over 40 days. 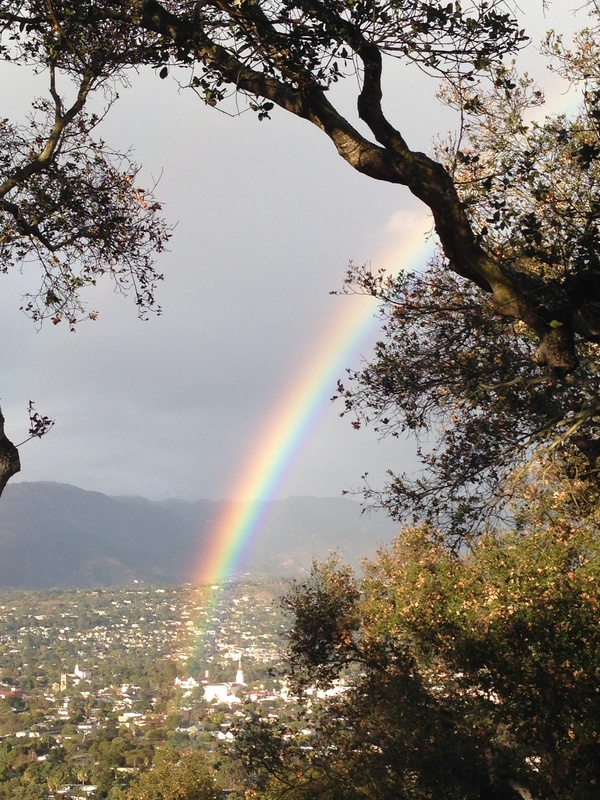 The rainbow showed up just after her neighbor died after a long illness, giving its benediction to the family. Last night we had a fair amount of rain and snow, and it feels like we will not dry up and blow away just yet. The Journal has published some useful articles lately on problems with access to health care, and I’d like to add my perspective as a provider out in the field. There are three main issues with access to care for New Mexicans: distance, cost, and scarcity of providers. I don’t have to tell you that for many of our residents, most everything is far away. Even in our smaller cities, there are not a lot of services. In Grants, where I see patients once a week, medical specialists come in from Albuquerque or elsewhere, as I do. People who need VA services must go to Albuquerque, no matter how elderly or disabled they are. It’s bad enough in a small city like Grants, but people who live in more rural areas, as some of my patients do, may be completely out of luck if they lack transportation. Getting more New Mexicans insured is necessary and commendable. However, this does not remotely solve all the problems with the direct cost of medical care to consumers. As those who are shopping on the state exchange have no doubt noticed, many plans have deductibles in the thousands of dollars. Also, with some plans patients pay as much as 90% of the cost of the service themselves, even after their deductible is met, because their copays are so high; they are paying for coverage that they don’t get. The ACA was intended to bring deductibles and copays into the realm of reason, if I understand correctly, but as it is, cost limits access even for those who are insured. For those on Medicaid, at least, copays are low or nonexistent. However, very basic and critically necessary care may not be covered. For example, one of my elderly patients needs drops for an unusual and painful eye condition caused by her recent case of shingles. The cost is low compared to most of her care, but Medicaid is not covering this medication, and on her extremely limited Social Security income, this lady can’t afford enough of it to last through the month. For all the millions we spend as a state, we still can’t get people simple things that they need badly. And while the myriad costs add up to so many millions, Medicaid and Medicare payments to providers are so unsustainably low as to keep providers out of the programs, exacerbating the access problems all the more. Our state’s lack of health care providers has multiple causes, but it also has the potential for multiple solutions. Making better use of mid-level practitioners, as many have suggested, is certainly necessary, and any efforts which will attract more health care workers are worth trying. However, there are other available health care forces which are only partly being tapped. One of your editorials did refer to “traditional community health workers,” by which I assume you mean people like curanderas/os and Native healers. Encouraging greater use of their abilities would be a definite help– but how is that going to be funded? For the most part our insurance system has ignored the existence of these valuable resources, as it has ignored herbalists, homeopaths, and those who do energy healing such as Reiki. Most federal dollars will also bypass all those practitioners and the people who rely on them. New Mexico has a formidable and growing health workforce in the members of my profession, Doctors of Oriental Medicine. We too are being used far less efficiently than we could be, even though most commercial insurance in the state does cover our services. Decision makers don’t seem to realize how much primary care we do– and we have not yet managed to get the word out to them sufficiently. We are lumped in with “rehabilitative medicine” by insurers, but that is only one aspect of our medicine. Patients walk in to acupuncturists’ offices with everything from flu to IBS to sciatica, and we treat them effectively. We are well placed to help take the strain off of primary care MDs, and we are ready and willing to serve. However, provider groups organizing “patient-centered medical homes” have generally not included us in their planning. Medicare does not cover acupuncture, and under most circumstances Medicaid also does not, largely because the federal dollars are not available to make that happen. Attempts to fix this in the state and federal legislatures have failed thus far. So immediately a huge proportion of our population is left out of a major form of effective and cost-effective medicine. And while our NM-based insurers do offer coverage, as I mentioned before, in many cases reimbursement is slim and patients are left to pay as much as 90% of the charges, so that this “coverage” is not very meaningful. (Fortunately, there are also many plans with much better coverage, I must add.) Yet, many patients do use us as their front-line care providers, and that could be expanded. There are still other possible providers as well. In some situations a chiropractor may be the best choice to see first, and access can be a bit easier than that for DOMs, with so many chiropractors available and a good number of them accepting Medicare. For at least some conditions these practitioners could also help to ease the burden on primary care MDs. Physical therapy is usually given limited coverage, and patients tend to be referred to PT only after they have failed to get better for a long period of time. That is inefficient and leads to unnecessary suffering. We could use PTs more as the first choice, go-to practitioners for injuries, back pain, and the like. There is one access problem that would be very easy to solve, IF those who are in charge were willing. That is the system of HMO and PPO networks. It was unconscionable when Lovelace ended its relationship with ABQ Health Partners and tore hundreds of thousands of New Mexicans (including my family) away from the doctors they knew and trusted. Now Presbyterian has stopped coverage to the UNM providers, again leaving patients in the lurch. We could stop this kind of abuse, I expect, legislatively or perhaps through actions of the state insurance department. I am not holding my breath, but as the provider crunch gets more and more serious, I hope access will be broadened across insurance networks. There is no good reason for things to be this way; we all pay and we all deserve to have the best providers for our needs. HMOs were supposed to reduce costs and improve health outcomes. Neither has happened. Time for a different approach. And we do have a different approach waiting in the wings: the home-grown, NM-specific Health Security Act is still here and has been gathering more and more support over the years, though so far it hasn’t made it past all the Powers That Be. In the next few years we will have the opportunity to improve upon the current health insurance exchange and enact this more efficient plan. We can choose to do it– it’s just a matter of willingness. I must say that on the fairly rare occasions when I’ve gone to an MD, as for my yearly OB-GYN checkup, I’ve had more like a 25-minute appointment. I hear that this is not usual, but it has been the norm for me thus far, perhaps precisely because I’m not there all the time– I’m having more than just brief followup appointments. So I have a little bit of hope, but again, as the provider crunch gets worse, that hope is likely to evaporate. Now let’s think about what actually happens during that 10, 15, or possibly 25 minutes. What are primary care physicians for, and do they fulfill that purpose? One of the main things they do is to prescribe and authorize refills of medications. In the case of chronic illnesses, they should be able to help the patient maintain well and deal with any changes in their condition that come up. Well, last week one of my patients, who has been taking Synthroid for decades since she had thyroid surgery, went to see her new PCP, who had been forced upon her by the issue I mentioned above, Presbyterian ending its relationship with the UNM system. Her last PCP had reduced her dosage, and she had done extremely poorly until she figured out the problem– herself– and started taking the higher dose again. She explained all this to the new guy, but he flat-out refused to consider prescribing the dose she needs. Total failure both at paying attention to the patient and at delivering the treatment. Especially at paying attention! I wish I could say this was unusual, but it’s what I hear from patients over and over and over, and it seems most common with regard to thyroid issues. * In this case, there was an out– I sent the patient to a colleague of mine who specializes in endocrinology and can prescribe natural thyroid extract. Not everyone has such an alternative, and many patients go without effective treatment. On the other hand, a patient who has recently entered the Medicare age group went for her first ACA-mandated Medicare yearly wellness checkup around the same time. This lady has had a chronic cough and severe fatigue for months, following a period of extreme stress, and although she’s improving, no clear cause has been found and the problem has been hard to treat. The idea of these yearly exams for Medicare is supposed to be to give the patient a thorough going-over so that any problems will be found and dealt with appropriately, keeping them from getting worse and causing more cost and suffering. My patient reported that the appointment lasted less than 10 minutes, she barely had the opportunity to ask any questions, her main complaint was not really addressed, and no treatment was suggested. And this is a very assertive and articulate patient. So it didn’t seem like the purpose of the exercise was fulfilled at all. The PCP is often the most accessible and cost-effective person for performing minor, in-office surgeries. And of course the PCP can order tests, which will either show that there’s no problem or perhaps guide the path to more specialized care. When I had that health scare back in August, I ended up with Bob’s PCP, Oswaldo Pereira, MD, who had no more idea what was going on than I did, but could send me for further testing. We ruled out a number of possibilities, and that was helpful and quite necessary; I needed to know that I didn’t have a cardiac issue, for example. However, Dr. Pereira never came up with either a diagnosis or a treatment. Since we couldn’t find anything dire, and since I was gradually getting better, we both dropped the matter. I had the most significant improvement with a structural approach, under the care of my friend Christine Dombroski, PT. Dr. Pereira, thoughtful and knowledgeable as he is, would never have thought to send me there, and didn’t really understand why this helped. It’s just not part of the way MDs are usually trained. Do head for urgent care or the ER if you have severe unexplained pain, trouble breathing, or other scary symptoms that are not resolving in a reasonable way at home. And of course if you are having any signs of a possible heart attack or stroke (I should write another post on those), you should call 911 as soon as you can reach the phone. *It doesn’t have to be that way. Both my last PCP and my OB-GYN tend to dose thyroid replacement on the basis of symptoms rather than strictly by blood test results. They are not unique, fortunately, just not the rule. **Update, later in the day: This morning my mother saw Dr. Jones again, and she is leaving most medication issues up to the specialists. So I ask again, what is the PCP for? It’s not easy for 89-year-olds to get to appointment after appointment, nor for their families to get them there. As I was writing this, I came across a great Medscape article by a doctor who has a vision of what a true health care system could be like. You may have to sign up with Medscape to read it, but if you have any interest in medical matters, it’s well worth it. ‘”She sat down with all of the physical-education, biology, and health-education teachers in her system, and together they outlined a plan to change the curriculum such that health education starts in kindergarten. In their system, by the time children reach the 12th grade, they know which side hurts when their appendix is about to rupture. They know the warning signs of a heart attack. They know when to start screening for colon cancer, and they know when it’s appropriate to access the doctor’s office, the urgent-care clinic, or the ER. They understand the basic dangers and positives of over-the-counter medications. In other words, by the time someone puts a high school diploma in their hands, they are as well equipped to take care of their bodies as they are to find their favorite iPhone app. All this could happen. There’s no reason why it couldn’t.